So We Have Google+ Pages, Now What? I’m going to be honest here. I haven’t been swept up in the Google+ hype of the last few months. I just haven’t, I don’t know, gotten it. To me, thus far, I haven’t seen the killer app or need that Google+ fills that Facebook/Twitter/LinkedIn doesn’t. So, I haven’t spent a lot of time there, and have seen lots of duplicate content across my various networks. 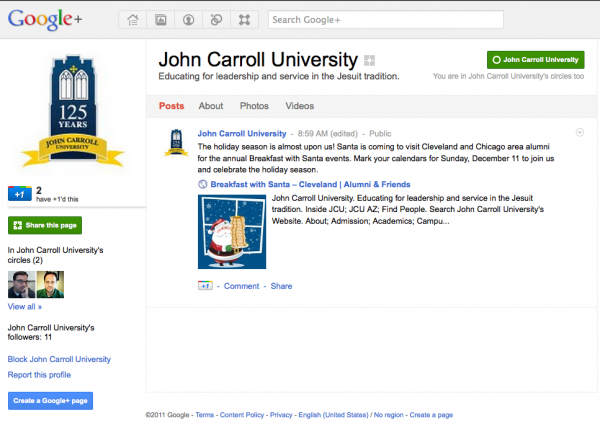 This week, Google allowed brands/companies/schools to start having their own Facebook-Fan-Page-ish Pages inside Google+. I, like many other web and marketing folks, created a page for my University. The setup process was fairly simple, and I had the profile setup in a few minutes. Do I re-post content we’re already posting to over 5,000 fans on Facebook, or should we be creating content just for Google+? These are the types of questions that I guess many teams are now wrestling with. Having just spent a small amount of time, I have some questions about managing a Google+ page. 1. Am I the only person who can administrate this page? I see that one the circles/streams available on my Page is one called “Team Members,” but its not clear if I add people to that stream/circle if they are given the right to post on the page. 2. My page displays the 2 people I’ve put in the Team Members circle on our home page, and shows that we have 11 followers, which isn’t bad for two hours. Unfortunately, I’m not seeing a way to see who the followers are. I can now see who is following me, and choose to add them to one of my circles. This is a marked difference from Facebook’s model, which is more one way the two services are different. If you’re a fan of JCU on Facebook, as an administrator I don’t have access to your page and personal info. Not sure what the right model will be here on Google+. What circles should I put them, since I’m encouraged to do that in the Google+ model. Students? Alumni? Faculty? Friends? Parents? Sounds like a minefield and a timesink having to determine what bucket a person should go in. 3. Where are the analytics? Facebook’s insights are pretty decent, but so far, I’m not seeing anything in terms of analytics for my Google page. How many times are my posts being viewed? What are the demographics, broadly speaking, of my audience on this site? What are the trends. Google has a killer app in Analytics, it should be really tied in here. If there isn’t marketing stats available here, I don’t see us really spending a lot of time focusing on our Google+ page if we can’t determine the ROI or value of having it. 4. I can add video and photos, but wouldn’t it make sense if I could link my institutional YouTube account and have videos I share there automatically get pulled in here? I could manually share them, but that’s an extra step that seems unnecessary. I should be able to hook the two together. I know this sounds unfair: Facebook had years to add all the features it has now, so why should we demand that Google create a perfect substitute at launch time? But that’s just the thing—taking on a behemoth like Facebook is an unfair fight. Google seems to think about its social network in the same way it thinks of any other kind of software—as a “product” that it can design step-by-step, starting with a small number of innovative features and working up from there. We as web and marketing folks have been spoiled by Facebook and their fan page offerings, so much so that we expect any competing, new product to have all the same, if not better, functionality. I’ll be keeping an eye on our Google+ page and placing content there, but it won’t be the first place I think to post content, which Facebook is now for us. Google again rushed into releasing a product before it was ready. I have a page made for RMU but where is the custom URL? how can i prove that THIS is the real RMU and not another poser? You can’t make admins on it. There are just some fundamental things that are missing. From what I’ve seen other higher ed places are in the same boat. We have this tool, now what? I’m not expecting a ton of traffic to this just yet but I will add it into the rotation of sites to update. Thanks for this post! I understand that at the beginning you could not see who are your page’s followers and then you updated the post that you can now see them. Can you tell what have you done in order to see them? I’m having the same problem on my Google+ page.